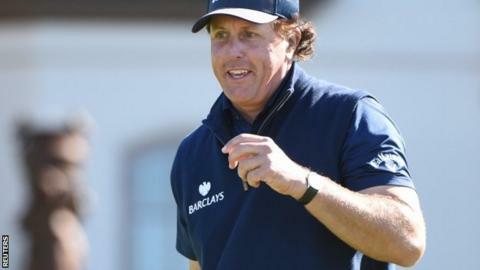 Phil Mickelson takes a two-shot lead into the final round of the Pebble Beach Pro-Am as he looks to win a record-equalling fifth title. The five-time major champion posted six birdies in a six-under 66 to lead an event after three rounds for the first time since the 2013 US Open at Merion. "It's fun to be back in the thick of it," said the 45-year-old left-hander. Japan's Hiroshi Iwata (69) is second on 14 under while England's Justin Rose (72) faded from 13 under to nine under. Rose, who came from two shots behind Mickelson to win his only major at Merion three years ago, made the perfect start to his penultimate round at Pebble Beach with four birdies in his opening six holes to share the lead. However, bogeys on the eighth and ninth holes checked his progress while further dropped shots on the two par-fives on the back nine saw him finish the day on the same score he started it. Mickelson, who had three successive birdies on the front nine, a fourth on the 11th and closed with two more on the 17th and 18th holes, needed just 21 putts in his round. "It's been a while since I've been in contention and it would mean a lot to me to be able to play a good final round," he said. Iwata's three-under-par round came at Spyglass Hill, one of three courses being used for the tournament which finishes with everyone playing Pebble Beach on Sunday. Sweden's Freddie Jacobson had a three-under 69 at Monterrey Peninsula and is alongside South Korea's Sung Kang, who had a two-under 70 at Pebble Beach, three behind Mickelson.